When a laptop or notebook fails, it hurts in so many ways. Yes, you lose productivity, but there’s also the cost to the user’s general job satisfaction and their ability to hit their objectives. Then there’s all the extra time it takes to get back up to speed, as well as countless other factors that all contribute to the true cost of a device failure. Fortunately , Panasonic devices have a much lower failure rate when compared with the industry standard. But with Panasonic's Rapid Replacement Service, if you do have a broken or failed device, we get you back up and running - fast. With this option, we reduce our best in class device replacement time from 96 hours to just 24 hours. Making sure you can always deliver great service to your customers. of replacement devices for you. will be assured by its own SLA. by giving users familiar replacements. 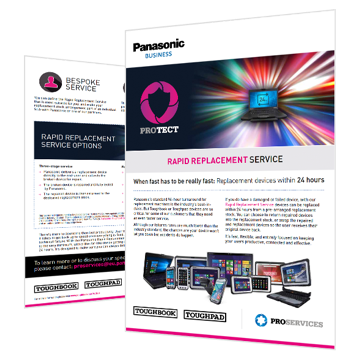 Find out more about the Panasonic Rapid Replacement Service, with full details of service options and arrangements for returns and deliveries.